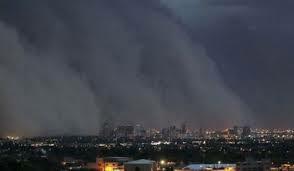 If you have ever experienced an Arizona dust storm, I don’t need to tell you just how damaging and serious they can be. If you are driving and get caught in one of these storms, there are some things that may help prevent serious injury to you and those around you. I have encountered some very strong winds on a few occasions prior to the actual dust storm but fortunately made it home before visibility made it impossible to drive... but believe me, I was prepared to pull over to the side of the road as recommended. If you would like to see additional facts including the causes of these storms, log onto usg.gov. One of the best things to keep in mind is that these dust storms in AZ often appear without any significant warning. The other thing to always remember is to NEVER drive into a dust storm. There have been many instances when drivers have found themselves in the middle of a dust storm with zero visibility with an end result of rear-ending another driver. If you are faced with a dust storm, immediately check the traffic around your vehicle (look in the front, back and to the side) and begin slowing your vehicle down. Do not wait until poor visibility makes it difficult to safely pull your vehicle off the roadway! Waiting too long could cost you/and your passengers your life/lives. The Arizona Department of Public Safety advises you to completely exit the highway if you are able to do so. Turn off all of your vehicle lights. This includes your emergency flashers. Set your vehicle’s emergency brake and take your foot off the brake. Stay inside your vehicle with your seatbelts buckled. Be patient and wait for the storm to pass. High-profile vehicles should be especially aware of possible changing weather conditions and are advised to travel at reduced speeds. For a printable PDF of these Arizona dust storm tips, click here.